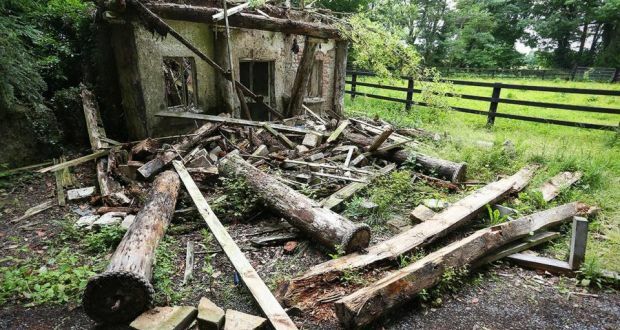 On August 29th last, the Irish Times reported that the portico of a small 18th century lodge in County Kilkenny had collapsed. Not, one might reasonably think, a matter of great import, certainly not as momentous as the disintegration of other buildings reported by the Irish Aesthete over the past year. But this is to ignore the architectural significance of the structure in question, and what its neglect over the past decade says about our failure to care for the built heritage. 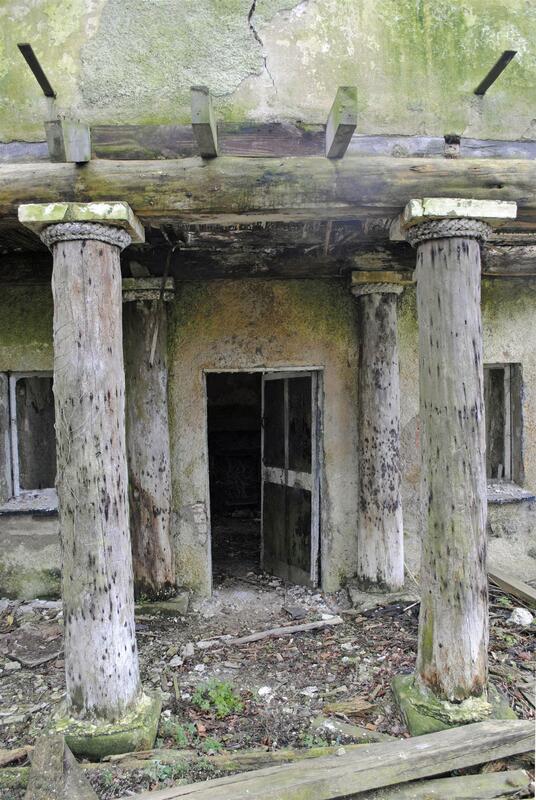 The temple or columnar lodge stands within the grounds of Belline, an estate not far from Piltown. In the second half of the 18th century Belline was occupied by Peter Walsh (d. 1819), whose family appear to have been agents for the Ponsonbys, Earls of Bessborough whose Irish seat Bessborough House was in the same part of the country. Walsh may well have been a tenant of the Ponsonbys; it is known that Lady Caroline Lamb, daughter of the third Lord Bessborough, stayed at Belline with her husband William (the future Lord Melbourne and future Prime Minister at the time of Queen Victoria’s accession) in September 1812 in the aftermath of her highly-publicised affair with Lord Byron. Dating from around 1770, Belline House was built by Peter Walsh who then went on to construct a number of other splendid edifices in the surrounding grounds, the majority of which survive to the present day. These included a detached gallery, known as the ‘Drawing School’ since according to Brewer, it ‘was constituted as a sort of academy for students by the active liberality of the late Mr Walsh…several children of the peasantry in this neighbourhood have lately evinced a considerable degree of genius for drawing. Such as were of greatest promise, Mr. Walsh took under his immediate protection, and supported in the pursuit of the art to which they aspired.’ Then there was ‘a most admirable pattern for a farm house; it is an octagon of two stories, inclosing a yard in the centre; below is a dairy, a residence for the dairy-man, cow-house, stable, and other offices, above is a loft for corn, extended over the whole building.’ And in addition there is a pair of circular pavilions behind Belline House, each three storeys high, the top floors serving as pigeon houses, and a pair of octagonal stone gate lodges (one still standing) at the southern entrance to the demesne. 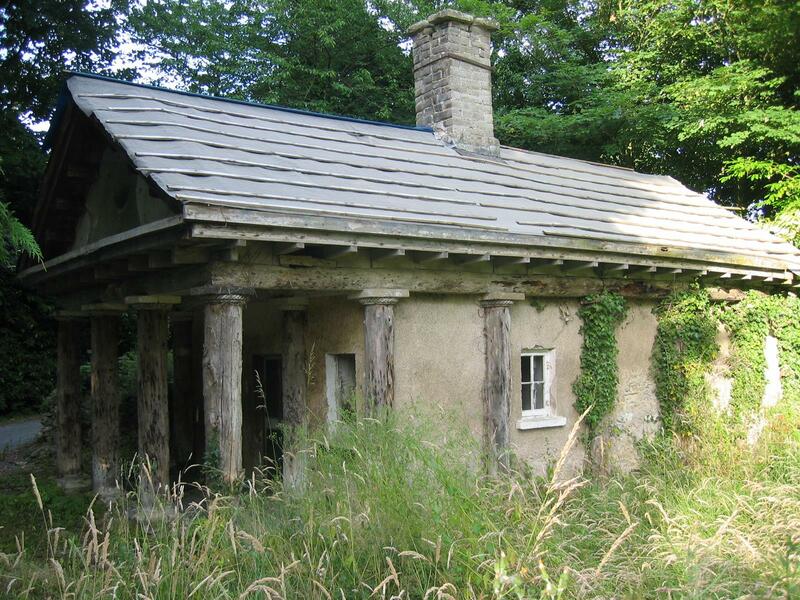 Finally we come to the smallest but perhaps most remarkable of Peter Walsh’s buildings: the temple lodge. 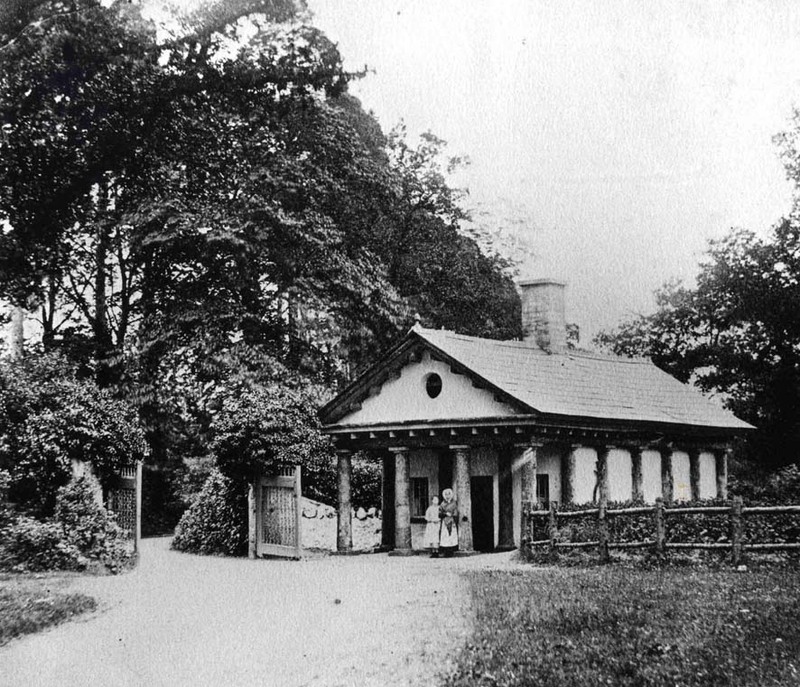 Comprising portico, front room and two rear chambers, its precise date of construction and purpose are unclear; standing in the midst of the estate and not beside an entrance it was unlikely to have been a gate lodge but might have been intended as a summer pavilion or model dairy. But what is most important is that Belline’s temple lodge has been judged the earliest known example in Britain and Ireland of the 18th century ‘rustic hut’ inspired by theories on the origins of man-made structures expounded first in 1753 by the French Jesuit and philosopher Marc-Antoine Laugier in his Essai sur l’architecture (translated into English in 1755) and then by Sir William Chambers in A Treatise on the Decorative Part of Civil Architecture (1759). In fact it has sometimes been proposed that the Belline lodge was designed by Chambers since it shares similarities with a drawing he made in 1759 for just such a building. The identity of the architect responsible may never be known but we can be confident that the Belline lodge is an important expression of the 18th century’s interest in exploring the past, and that its composition reflects the ideas proposed by Laugier and Chambers. 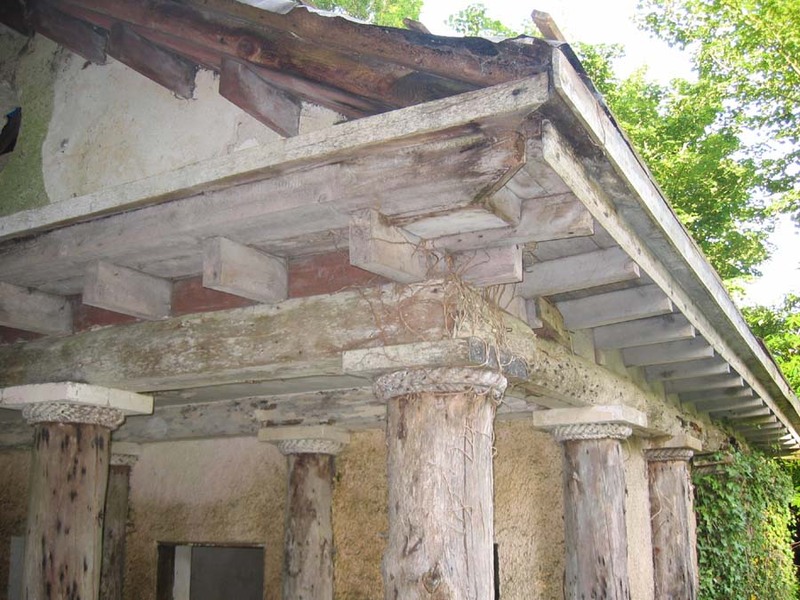 Hence the building is intentionally ‘primitive’ incorporating tree trunks bound with ropework on every side and a pedimented portico to the front below the gabled roof that extends beyond the walls to end in stone blocks. By the mid-19th century Belline had reverted to the Bessboroughs and remained in their ownership until 1934 after which the estate changed hands a number of times until being bought ten years ago for €3 million by businessman James Coleman. Managing director of a company called Suirway Forklifts based in Carrick-on-Suir, County Tipperary Mr Coleman has in the past declared himself a passionate enthusiast of motor rallying and indeed his business has sponsored a number of events for this sport. On the other hand, he seems less keen to support and sustain the national heritage, since over the past decade Belline’s temple lodge has fallen into such dilapidation that, as was reported by the Irish Times less than a fortnight ago, the building’s portico has now collapsed. 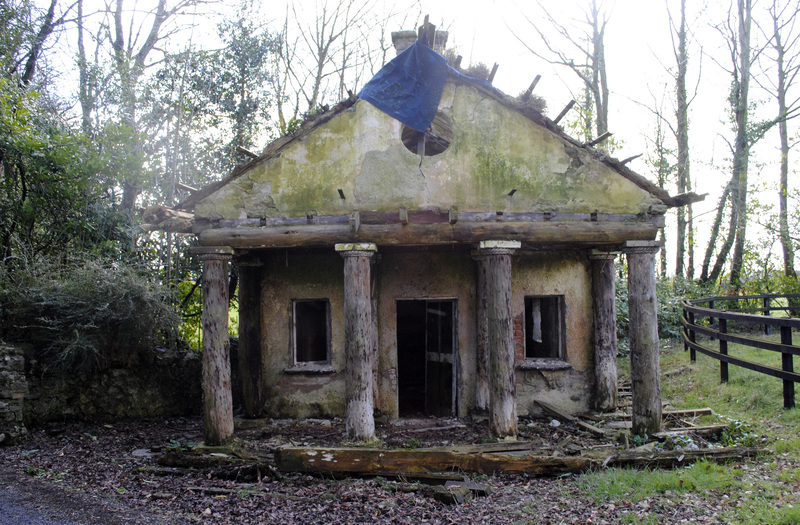 It is inconceivable that the lodge’s deteriorating condition was unknown to its owner: there have been two reports on the building and its importance, one compiled by architect John Redmill in 2005, the other by chartered surveyor Frank Keohane earlier this year. Furthermore the National Inventory of Architectural Heritage designated the lodge as being of architectural interest under the Categories of Special Interest. On the other hand as Frank Keohane noted in his report, to which I am much indebted, until now the lodge has not been designated a protected structure in its own right but rather ‘deemed to be protected owing to its being located within the cartilage of Belline House which is a protected structure.’ Clearly this has proven inadequate. Keohane wisely makes the point that the lodge at Belline must be regarded as of international importance both in its own right and as part of a planned 18th century demesne in which diverse complementary elements contributed to the resultant whole. 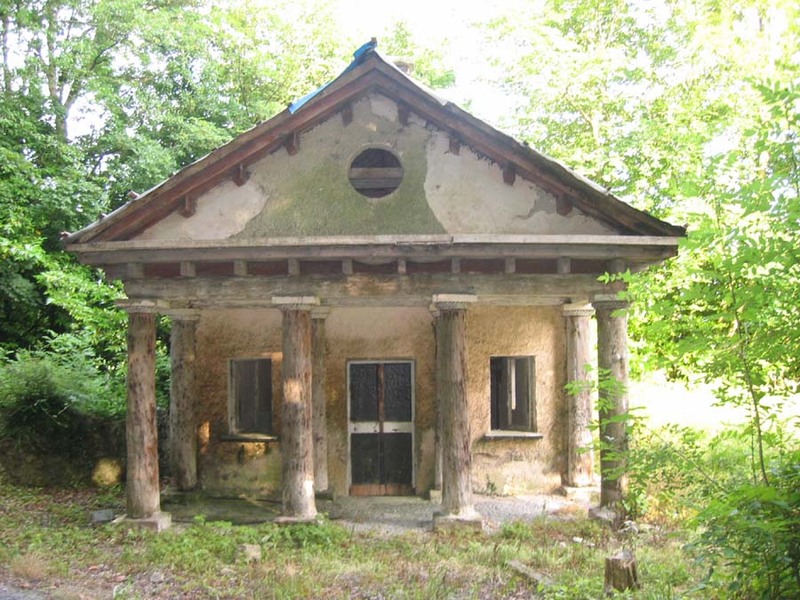 As he writes, ‘The temple lodge is not an artefact to be appreciated in isolation. It is in fact an important element in a group of related structures within the demesne.’ Destroy one of those related structures and you disrupt the entire picture: it is not unlike cutting a section out of a painting. One waits to see what will happen in four weeks’ time since not only is the survival of Belline’s temple lodge at stake but the forthcoming hearing represents something of a test case. If owners of protected structures can ignore their responsibilities with impunity, then still worse misfortunes lie ahead for our architectural heritage. The national patrimony is at risk in a way that would, one imagines, have appalled Peter Walsh. 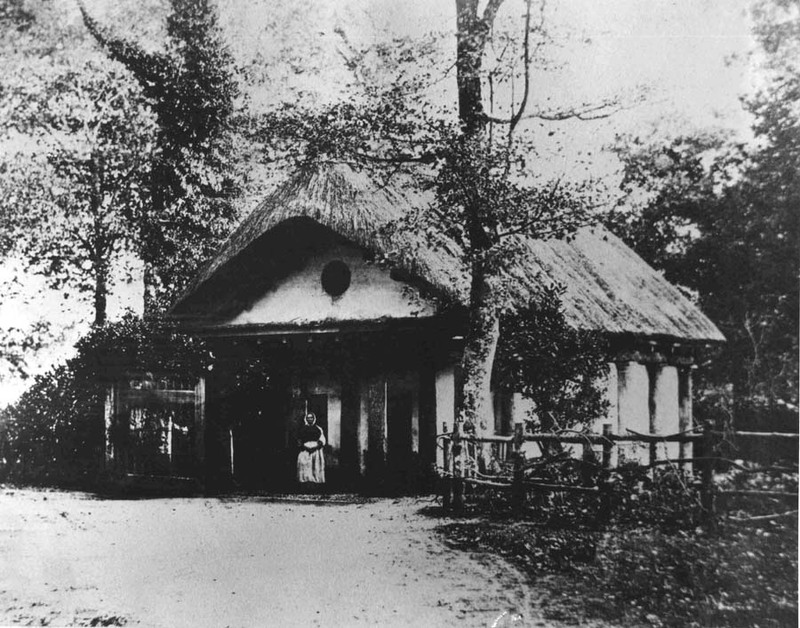 The first two photographs show Belline’s temple lodge as it looked in the 19th century, note how at one time the building was thatched. The next three show the lodge in 2005, already with its slates removed from the roof, followed by another three photographs taken earlier this year. 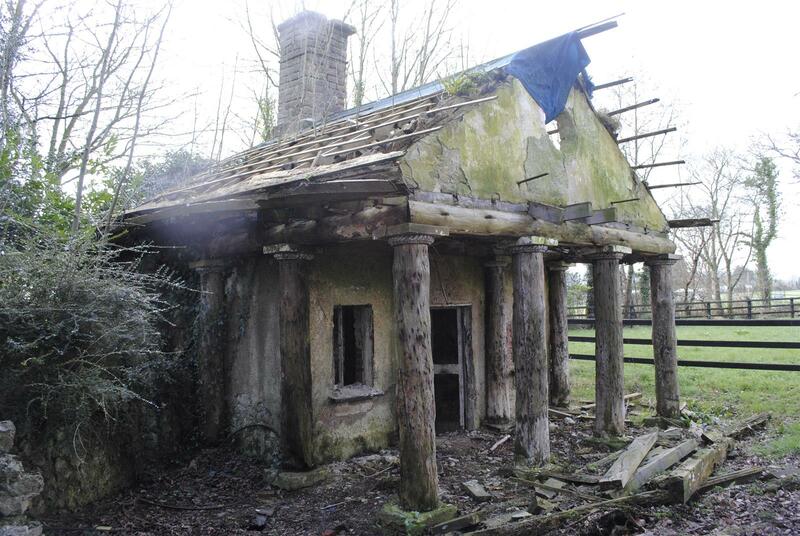 Finally below is a picture of the lodge as shown in the Irish Times with its portico in ruins. This entry was posted in Architectural History, Country House, Heritage at Risk, Kilkenny and tagged Architectural History, Belline, County Kilkenny, Georgian Architecture, Heritage at Risk, Irish Country House. Scandalous. I can think of numerous heritage buildings and follies which are heading the same way. When are we ever going to realise the treasures that are so unique and priceless here? Even Glendalough…have you see the old dilapadated shed in the ancient graveyard? It’s an embarrassment at one of our most historical monuments. There’s an Ice-house falling under the weight of Ivy that I’m thinking of in Cavan. Its design was genious. It will soon fall in and no-one will ever know its history. What a shame. How sad to see such an important unusual Lodge allowed to disintegrate to such a shameful end. A ‘ to and fro’ legal trail’ while Rome burns’ is too late for protected structures like these. KKC needed to move faster regarding enforcement of their own and owners obligations. This Lodge has disintegrated before our eyes and appears all that will be left is a legal file gathering dust on a shelf. Thank you for your comment. It is rather shocking that this has dragged on for so long, when it was apparent as far back as 2005 that the building was suffering from neglect. Hence the case next month is of importance to see whether the local authority will now act to rectify the situation and oblige the owner to accept that with ownership of an historic property comes responsibility. We have a similar situation here at Killegar with a magnificent entrance hall that is going to topple. We can not afford to have it repaired as there are so many ‘more important’ repairs required but it is absolutely heart breaking to see it happening. Hi there, thanks for this interesting article, I’ve searched on the internet for the outcome of the court case in October to no avail – are you aware of the outcome? Thanks. Thank you for getting in touch. I am out of the country at present so unable to see if an answer to your query can be found. On the other hand, the Belline estate was placed on the market some months ago, so this may have changed circumstances somewhat. I will see if it is possible to discover what, if any was the outcome of the case: have you telephoned the relevant local authority? I am wondering if there are any updates on this? Thank you for your enquiry. The late Jeremy Williams was trying to see whether the lodge could be rebuilt, but had little success before his death last December. I have not heard of any further progress since then.